First of all, thank you for your wonderful website! I have question regarding self-teaching for older dancers (I am 28). For a little background, I dance salsa for 5 years, also had a few months of swing classes. I am really want to learn contemporary dance. I had attempted to find classes but they were very few plus the students were almost exclusively younger girls with some to lots of experience. I tried to learn some techniques like Eric Franklin, Horton, etc. and had limited success (especially enjoyed Franklin exercises and they were helpful), but many many other things really need to be improved. So my question would be, are there any specific teaching books, videos or perhaps even online classes that you could recommend that would help me improve technique and/or get a better understanding about long term progressive dance technique development? You know there are many approaches for dance technique development and the path you follow depends a lot on your own self needs. Unfortunately, I don't know of any learning books or videos that are outstanding enough to recommend them to you. However, I will suggest some things but that does not mean that they will fit your expectations or actual learning needs. If you still want to try a modern style, I know there's a work by Daniel Lewis about the technique of José Limón. ("The illustrated dance technique of José Limón"). You will find that one available at Amazon.com. Something that might be helpful too is to take very basic and easy ballet classes. I believe that even professional contemporary dancers should study easy ballet from time to time, with no other goal than feeling its placement and technical propositions. If you study ballet WITH EASE, you may learn A LOT as a contemporary dancer. And I would not give importance to the fact that the class mates are young girls. More important than that is the level of the class, that should be just right for you, or lower. I recommend you to avoid higher level classes or exercises from videos that seem too difficult. Anyway, videos and books will never replace the learning quality of being guided by a good teacher, unless you are already highly experienced and can design your own learning process. I hope this helps, at least a bit. I will take a look at the Book about Jose Limon's technique, seems like it could be interesting. Perhaps more books like that would help, for instance books targeted at teachers that focus on improvement, progression, goals, specific errors to correct, etc.? You're right about thinking of learning from didactic material for dance. 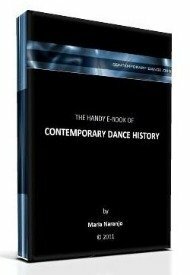 I know a very good series of books edited by the CND (National Dance Center in France). The downside for you may be that they're written in French. The good thing is that they're given for free to visitors to the CND. You might have a friend that can pick them up for you in Paris or you may even contact them to see if they'd send you a copy. They all make part of a collection entitled "Cahiers de la pédagogie". "Una metodología para la danza moderna" by Ramiro Guerra. This one is edited by the Cuban ministry of culture, 1989. I know those texts and I believe you can learn form them. However, if you have a serious school for dance nearby, I'd say you go and ask for their library. Maybe you have luck in there. Join in and write your own page! It's easy to do. How? Simply click here to return to Dance Questions About Learning and Dance Schools.